Keeping cool while sailing in the tropics, how? Most of us are sailors in the tropics… warm sunny weather …that is what is most pleasurable for cruisers. Swimming in bays with cool turquoise waters and swaying palm trees. Sundowners with the smell of coconut sunscreen on tanned skin, ice cold drinks in hand. But the seemingly contradiction is although we don’t really like sailing in cold climates the cost of sailing in the tropics can add to our cruising kitty. The interior of our sailing boats can feel like we’re in a sauna …sweaty and uncomfortable and hard to get a decent night’s sleep unless we do something positive about it. So what are some of the ways cruisers are keeping cool? 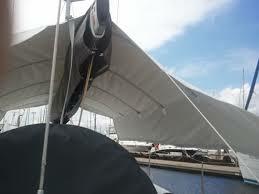 The most common solution to significantly reduce the temperature inside the boat is awnings, dodgers and Biminis. When sailing a covered cockpit or Bimini gives you the shade needed and hopefully you’ll catch a welcome sea breeze. 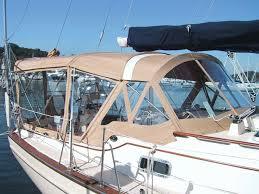 At anchor or in a marina some have a very large awning from backstay to the mast or beyond to cover the forward hatch. Keeping as much shade on the boat and that includes the cockpit will make it far more comfortable during the day, and will be keeping it cool during the night for a restful sleep. 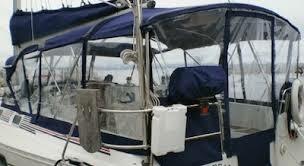 With some thought and working out you can have awnings Dodgers and Biminis custom made for your boat at a cost that will be worth it in the long run. On a budget … a decent tarp that’s UV stable, or shade sail draped over the boom, over windows and hatches will keep your sailboat a lot cooler. Get the air moving around inside by opening hatches and getting a natural air flow. Most monohulls have a hatch forward and when opened and shaded helps direct the breeze into the boat and can make an excellent wind tunnel through the boat. This of course applies best when at anchor and a yacht naturally points into the wind. There are other ways of keeping cool like a wind scoop which is a funnel hung from a halyard and secured to a hatch but this of course is not going to help you when you’re underway. What about when left unattended and you’re not on board? This is when a Dorade and mushroom shaped vents help by giving some airflow. Both these vents are designed to keep the water out while letting air in. Hot and No Breeze! What Now? An electric 12 volt fan is a way of creating a comforting airflow, they are quite and energy efficient. Place a few around your cabins…. In the galley and over your sleeping cabins most importantly but anywhere you spend time, even the heads. Yes ….air conditioning! This is mainly in marinas and many yachts carry portable ones that can be plugged into marina power …which is great in countries that include electricity as part of your boat fee … Australia is one of these places. If you are at anchor you will properly need a small petrol generator to run it. This can cause an issue as far as space. 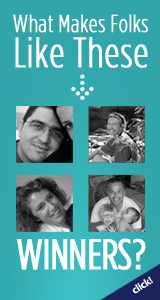 A built in air condition will also have a cost and space factor too but are the best solution. The unit would need to be mounted and ducting run to various outlets throughout your yacht so you would need enough space for this. You would also need a compatible sized generator and this too would require storage and be properly fitted. 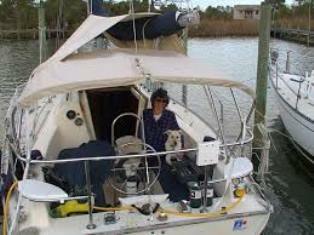 So it comes back to how hot or cold you are, how comfortable you need to be and the matter of money, but you can make your sailboat comfortable keeping cool with some thought and planning! Keep sailing the tropics and enjoy it!! !